Or: Why Architectural Research is Still So Difficult. One of the beautiful aspects of being involved in inter-disciplinary research is that you are a member of different and sometimes quite distinct research communities, each with their own practices, policies, cultures and behaviours. It means being exposed to different ways of doing things, and this can be eye-opening for your own research practice. Today was one of those eye-opening moments, when I downloaded an openly available network data set of face-to-face encounter in a primary school, collected and published by colleagues at the ISI Turino. To open the data set, I installed the free software Gephi and discovered in their tutorials and accompanying wiki a whole new world of data sharing. It lists dozens of freely available data sets, from social networks to biological, internet and infrastructure networks, including links to papers, where the data is described and analysed by the original researchers who collected it. I love this approach, because it 1) allows other researchers to test their own hypotheses with the data, 2) makes research and its procedures public and reproducible, thus more scientifically sound, and 3) opens up a whole new dimension of research problems to be tackled, i.e. 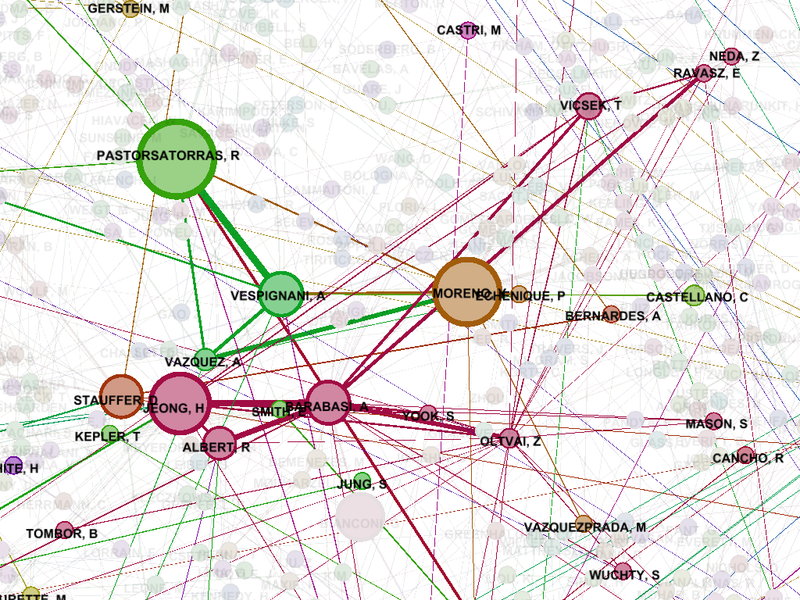 comparative research into the nature and structure of networks. In contrast, in the other research communities that I would call home, i.e. the wider architectural research community and the Space Syntax community, data sharing is not a common practice. But if sociologists and network scientists can do this, why can’t architects, too? The main source of data I am thinking of that would be worth sharing openly and freely in a digital and widely recognised format is floor plans and architectural drawings. So many interesting questions could be explored with this data: the evolution of building types (as for instance, my colleague Philip Steadman does in his latest paper on multi-storey garages), the emergence of architectural forms, architectural typologies, functional relationships, spatial configuration and aspects of space usage. However, very often this research is difficult to do because plan material is not available. Sometimes, floor plans are printed in glossy magazines, or expensive shiny books published by architects themselves, but this means that floor plans are often not complete and certainly not available in a digital format. The AJ Buildings Library is a step in the right direction, since it presents architectural drawings, images and plan material of exemplar buildings in a digital database. Unfortunately, it is a paid-for service only, which comes with a high price tag. For the wider public this means it is inaccessible (apart from a handful of free projects). And even for academics and universities, it doesn’t seem that easy. As far as I know, the librarians in my university are still negotiating access conditions at the moment and it is not yet clear, whether as researchers we will benefit from this collection. Additionally, no vectorised data is available. This means I could potentially download a PDF with a floor plan, yet I cannot process it in a CAD software for further analysis, because it is an image file. I appreciate that AJ is a commercial organisation and needs to make money, fair enough. However, I am not sure I understand why data can’t be available in a digital format that is usable for further research. The other type of data valuable for architectural research and worth sharing would be case studies and observation data. In the Space Syntax community, for example, hundreds of complex buildings have been studied and analysed by researchers from all over the world. As a community we gather at bi-annual symposia (the next one is in January 2012 in Santiago de Chile) and share our research results with each other, yet we fail to create an openly available and accessible data repository that would allow other researchers to ask new questions using the same data. I know that some individual researchers have their own collections of data, including myself, but we simply have not understood how to really share our work. I personally have shared my data sets in the past, and having been socialised in architecture school, where secrecy was more common than sharing and support, I admit I have found this difficult at first. But if you think about it, you can only win from data sharing – winning new insights, new collaborators, new knowledge and reputation. What else would you want to have in this world? Thanks for the mention in your post – the issue of information sharing in the architectural community is an extremely interesting one, and one that we want the AJ Buildings Library to be at the forefront of. However, I have to disagree that the Library has a ‘high price tag’ as I believe at just over £100 a year the AJ subscription, which includes access to the AJ Buildings Library and the AJ online, the weekly AJ and the monthly AJ Specification, presents very good value for money. you are right that as a package for individual AJ subscribers the Library is a good-value-for-money product. It still is a product, and the point I was making is more fundamentally about open access and data sharing (which is very common in certain research communities, as I was arguing). Pay for services simply provide access barriers. This is very much along the lines of the recent debate in the Guardian on academic publishing and access to information that – in an ideal world – should be free and available to all (http://www.guardian.co.uk/commentisfree/2011/sep/02/bad-science-academic-publishing?CMP=twt_fd and http://www.guardian.co.uk/commentisfree/2011/aug/29/academic-publishers-murdoch-socialist). And in times of education funds being cut and university libraries having to think about their expenditures, access even for academics within institutions might not be as easy as one might think.